I LOVE anything bunny. 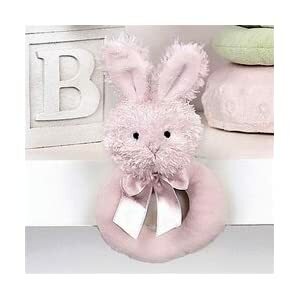 To me, there isn’t anything sweeter than a little one tugging around a sweet bunny toy or blanket. 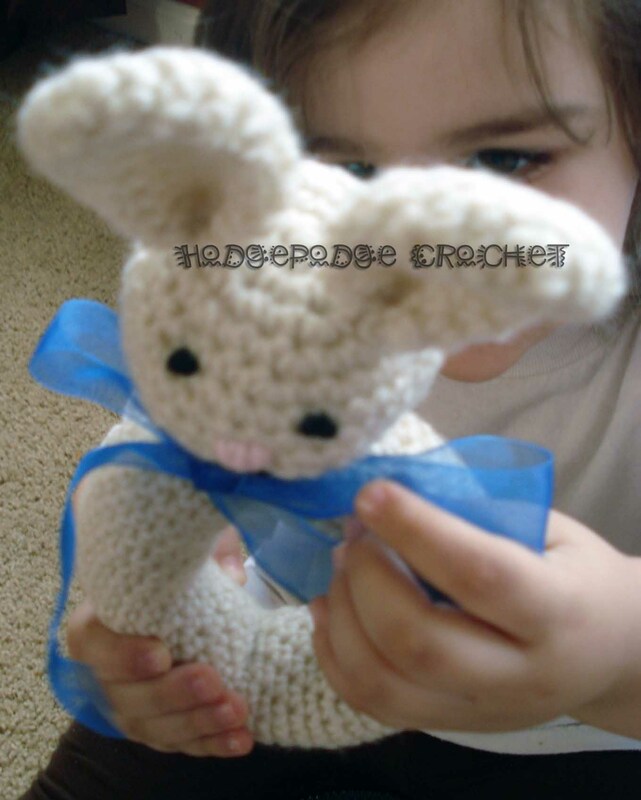 So naturally, when I think bunny–right away my mind translates that to CROCHET! 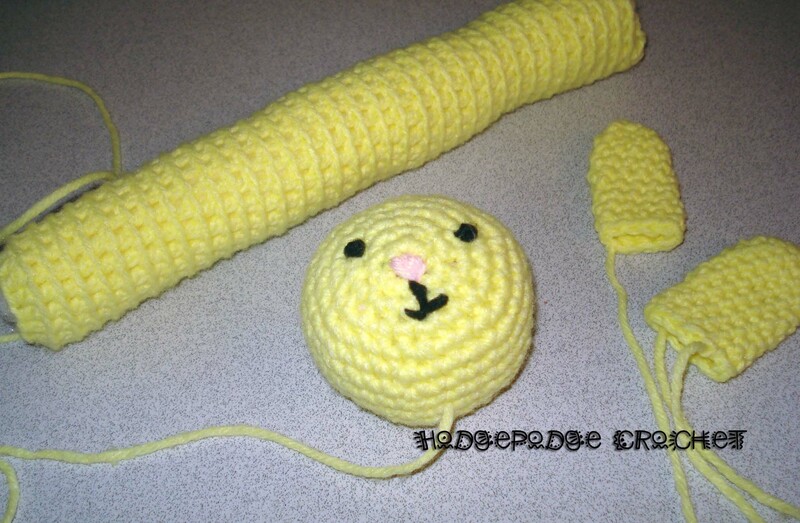 I’ve done crochet amigurumi bunnies before and they’ve taken a loooooong time going round and round in circles–so this time I thought I would simplify things by chopping out the bunny body (and all that work) and just keep the cutest part–the head and ears! 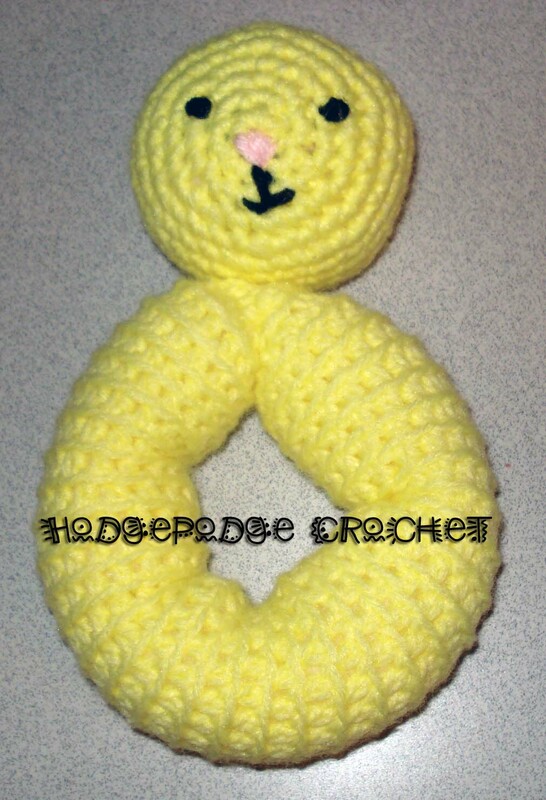 A cute chunky handle for baby to grasp and long ears for baby to nibble make mommy a happy lady! I quickly snatched up my hook and what came out is something I’m totally in love with! Red Heart Super Saver in any color suitable for a bunny. Small lengths of black and pink yarn to embroider with. Note: The ribbon will be tied around the toy for PRESENTATION ONLY. Remove ribbon decoration before giving to baby. Sc2tog: Single crochet 2 together. 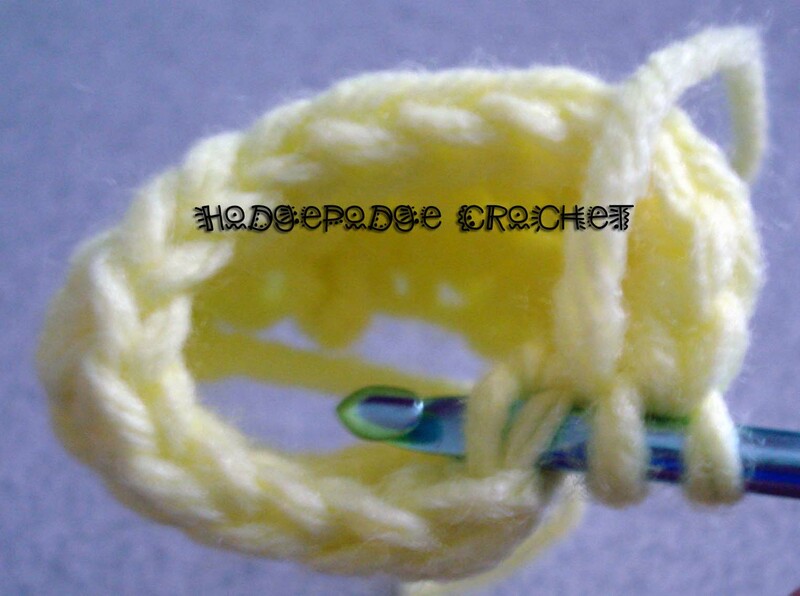 [Insert hook in next stitch, yarn over and draw up a loop] twice, yarn over and draw through all 3 loops on hook. Finished project measures approximately 9 inches (from tip of ears to bottom of handle) and is approximately 4.5 inches wide. Rnd 2: For the rest of the handle you will be working in a continuous round—meaning you will not be joining with a sl st and chaining 1. 1 hdc in back loops only each st around, Continue until handle measures 1o”. To end the tube, 1 sc in back loops of next st, sl st in back loops of next st. Fasten off leaving a long length of yarn for sewing later. 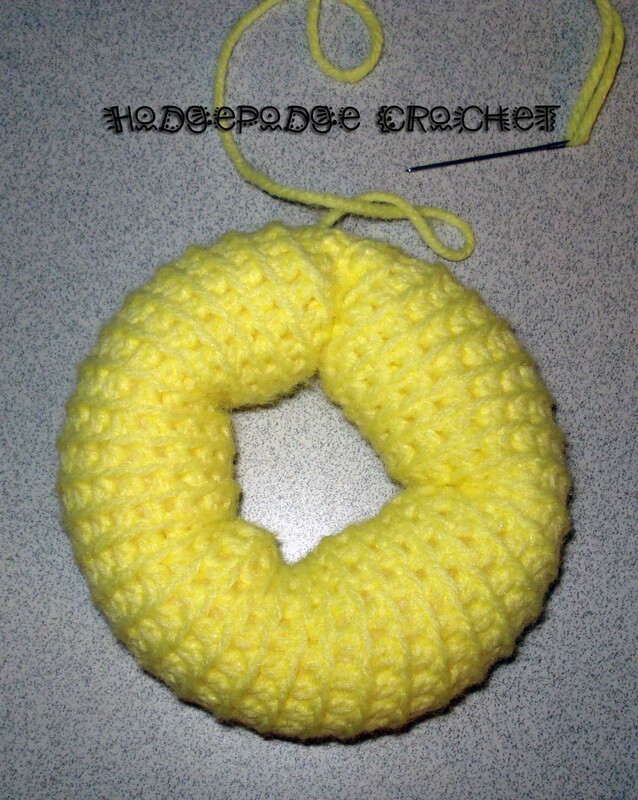 Note: To make a tighter crocheted finished handle, go through BOTH back loops of each stitch instead on just one. Rnd 1: 6 sc in an adjustable ring. Join with a sl st in the 1st sc. Pull tightly to secure and use your tail as a stitch marker to mark the beginning of the next round. Before you finish your head, now would be a good time to embroider the face. I like to embroider my face at the magic ring. Turn your head on its side and, using the magic ring as a guide, stitch on the eyes using a french knot and the nose using a satin stitch. Embroider the mouth using a straight stitch. Stuff the head with cotton stuffing. Rnd 16: [sc2tog] (3 sc) Fasten off. Rnd 4: Sc in each sc around until the ear measures 2.5 inches. Do not stuff. Fasten off. 1. Stuff handle firmly and bend into a circle. Using your tapestry needle, sew ends together to create a round shape. 2. Sew head to top of handle. 3. Pinch ears into shape and sew to top of head. 4. 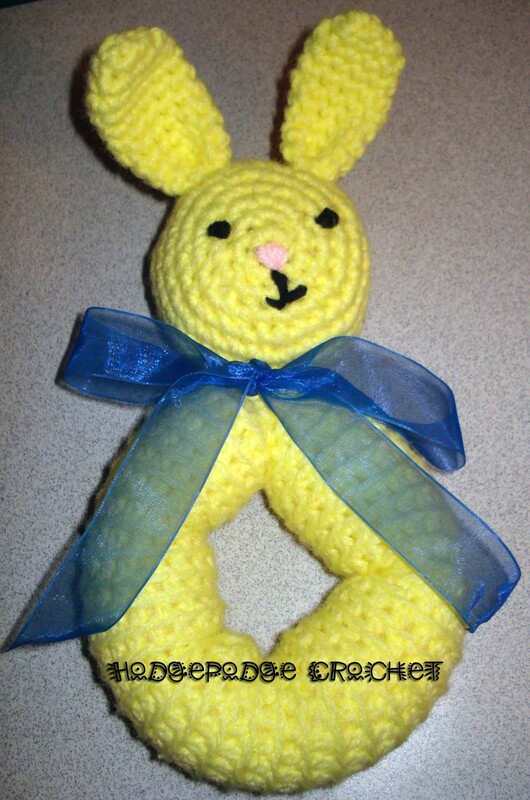 Tie ribbon around neck and your bunny is complete! 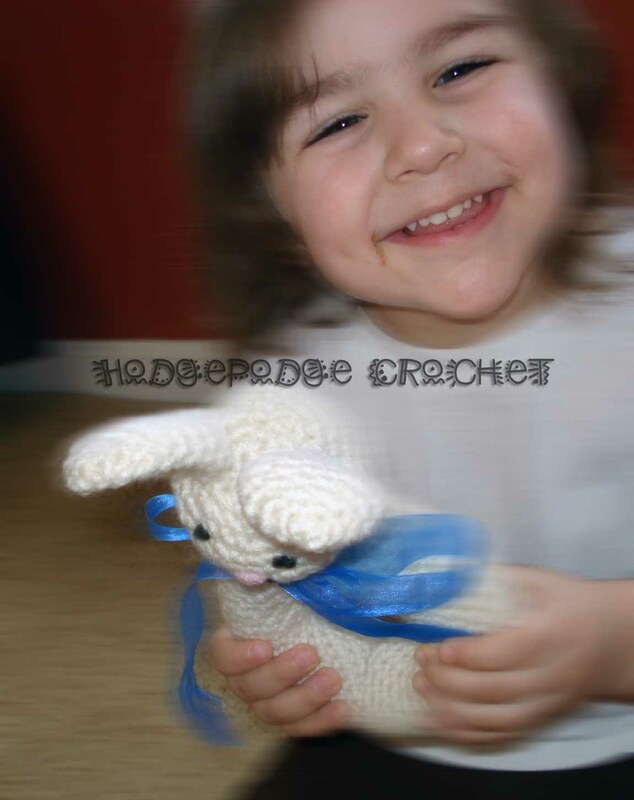 Don’t forget to share your projects over at our HodgePodge Group on facebook! Lovely pattern,Thanks for sharing.God Bless You. Hi! 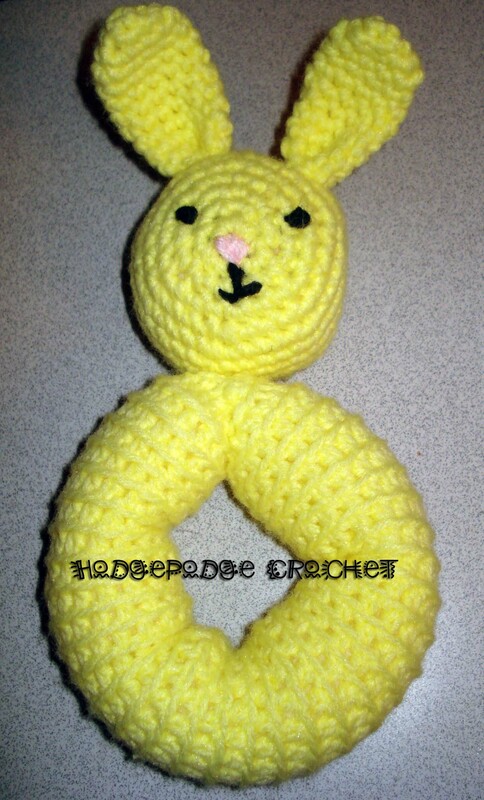 I found this while searching the www for a simple and cute bunny pattern for my twin grandbabies. This is perfect! I have finished crocheting the rings on each and am now working on the heads. Very clear instructions (thanks!). I would like to share a modification, if you will. For the ring, after finishing and leaving a long tail for sewing, weave it from tail end to the opposit for gathering the center prior to sewing. It will make a nice-looking round inner circle like a donut. Wish I could show you a picture. Also, I will be placing rattles in the heads prior to finishing them. The babies will love the tinkling sounds while shaking them. 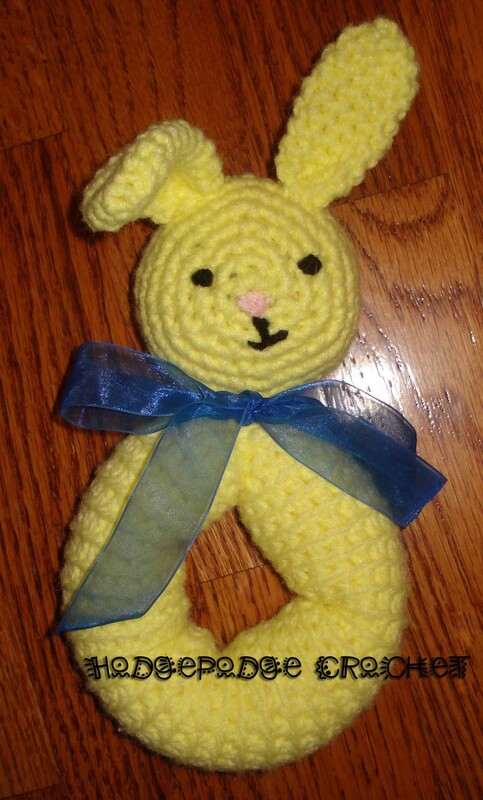 Thanks so much for the VERY cute pattern and sharing your creative talent!